* Monitors a log file or folder. Doing a tail using polling. * Monitors a table in a MS SQL-Server database. Doing a tail using polling. * Monitors Atom and RSS feeds. * Can highlight or hide messages depending on content. 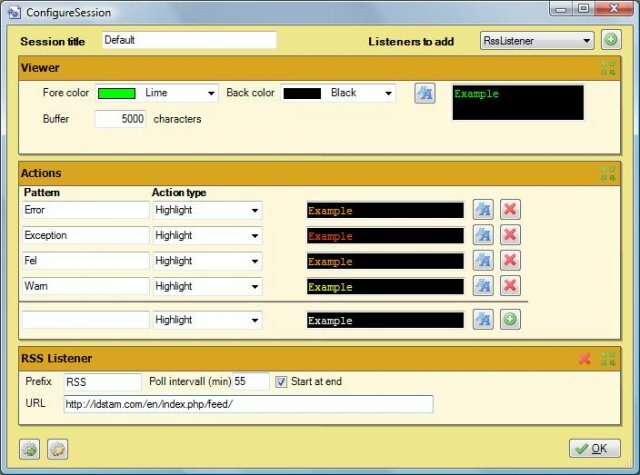 * Logview4net supports multiple simultaneous listeners in each session. * Logview4net supports several simultaneous sessions (MDI). Qweas is providing links to Logview4net 12.18 as a courtesy, and makes no representations regarding Logview4net or any other applications or any information related thereto. Any questions, complaints or claims regarding this application Logview4net 12.18 must be directed to the appropriate software vendor. You may click the publisher link of Logview4net on the top of this page to get more details about the vendor.